Lately I've been in a dinner slump. Nothing sounds good to make. I just don't know what I want to cook. Dinner time has been boring! I needed something to liven things up so instead of browsing the internet (like I normally do to find a new dish) I decided to research my trust recipe box. Many of the recipes were recipes my grandma would make and I had copied them, or wrote them down from memory after preparing them with her. This is one of the recipes I remember making. I decided this was a perfect recipe for my five-year-old daughter to help out with making as well. I let her pound the chicken breasts flat (which she loved!) 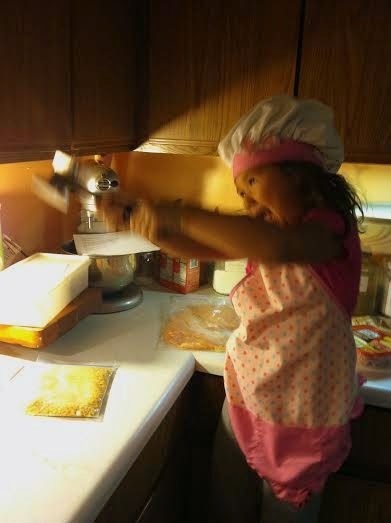 and she pressed the crumbs onto the chicken. Her job was always handing me the toothpicks to keep the breasts folded together while cooking. The best part was that she loved this chicken! I can't say anything bad about this easy dish, except that I don't care for blue cheese. Say what? The girl from the hometown of the best blue cheese in the world (many would say) doesn't like blue cheese!?! Yes, it is true. Even the famous Maytag blue cheese cannot convert my taste buds into enjoying that delectable stinky goodness that so many enjoy. You can check out the famous Maytag cheese website here and order some up for yourself to try if your local grocery store doesn't stock it. So, this is obviously a recipe that originally calls for blue cheese, hence the name of the dish, but you can sub with your favorite cheese. After much playing around with this recipe, I found that we enjoy swiss cheese in this! It works perfectly with the ham and the chicken. Mozzarella works well also. Just whatever your family enjoys. Of course, you could order some of that blue cheese and try it with that if you want to stick with the classics! 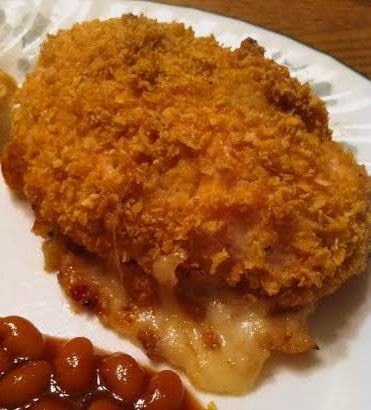 Like I said before, I let my daughter flatten the chicken breasts and crush the cornflakes (don't use cracker crumbs for this, or panko, you want the texture and flavor of the cereal - try it with Wheaties!) I took this snapshots of her in action. Get your kids involved, they will love this part, too! I guarantee it! Once we sat down for dinner and began eating, I remembered why my grandma always had this as a staple dish at the dinner table. It is simple to whip up, is filling, and tastes great! This brought me out of my cooking "rut" I was in and I have been revisiting our family's staple recipes since then! 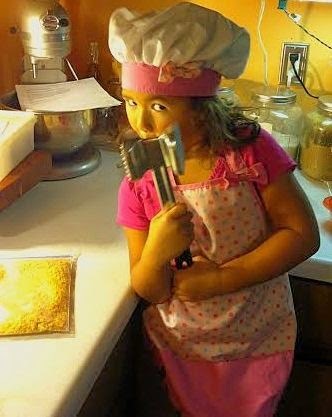 Enjoy cooking with your kiddos! Lightly grease a large baking dish and set aside. In a processor or zipped plastic bag, crush the cereal (a few cups) until they are in small pieces. Add the garlic powder, salt and pepper to the crushed cereal and toss to distribute. Add the milk to a bowl and set this aside as well as the crushed cereal. 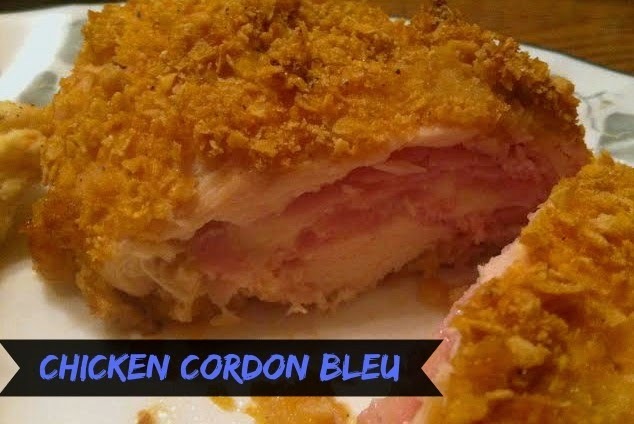 With the chicken breast flattened, add 2 slices of ham to cover most of the chicken. Add a slice of cheese to the middle. Fold up the chicken breast to conceal the cheese and the ham inside of the chicken. Use 3-4 toothpicks to hold the edges of the chicken together. Press the topping onto the chicken until all sides are coated. Place in the baking dish and repeat with the remaining chicken. Bake for 35-40 minutes, until juices run clear.